Do your students cringe, moan, and groan when you announce they’ll be reading and writing poetry? In order to avoid this, I try to make poetry fun. My aim is to give the students plenty of opportunities to play with the language. 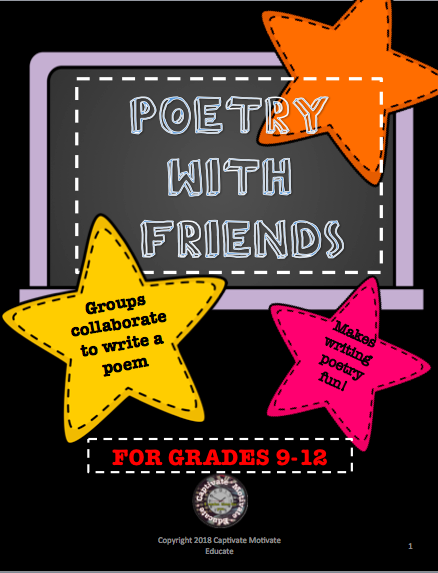 I’ve devised a group activity I call, “Poetry With Friends.” It’s a free resource in my TpT store, Captivate Motivate Educate. This resource includes a word bank that is sure to get your students intrigued. There are 120 words in the word bank. Students work in groups to discuss the word list, possible combinations, and the general tone they’d like to achieve. I have not included too many inconsequential words like “the” “and,” “to.” Since poetry is condensed language, these words are really not needed to achieve the poet’s purpose. These are conversations you’ll have with the students as you circulate around the room observing the poets at work. There may be a few words they’ll have to look up in the dictionary, but that never hurt anyone! You’ll soon start to hear giggles as they contemplate the possible content of their poems. Some students may opt for a serious tone in their poem and that’s OK. I usually tell them they must use at least 50% of the words in the list, and they must also include a title. Before students start cutting apart the list of words, I sometimes have them write a rough draft first. Once they’re happy with their poem, they cut and paste it onto colored construction paper. The students will be surprised at the effectiveness of their lines. Even if the poem is silly, it can be effective. It’s amazing how 120 words can yield such different poems, year after year. The ransom note style poems make an attractive wall display. I’d love to hear how your students enjoyed this activity. Next Why is WordPress so Hard to Customize?